Vale Koer – Close up on me ! • All items contains HUD with 4 Beads colors. Bodysuit : BLUEBERRY – Frappe Bodysuit – Fatpack . By Blueberryx NEW!!! Shorts : BLUEBERRY – Frappe Shorts – Fatpack . By Blueberryx NEW!!! Pose & Props BLUEBERRY – Snack Like You Mean It – GIFT!!! . By Blueberryx NEW!!! Corset : ADDAMS – Ditta Corset – N*3 . By AmaliaRainwood @C88 December 2017! Heels : VALE KOER –Night Shade Pumps – Black . By Bob @C88 December 2017! 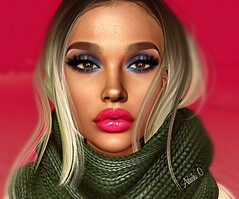 Hair : DOUX – Dreemdoll – Blondes Pack . By David Cooper (dam1710) THANK YOU HONEY <3<3<3!!! Lip Piercing : CODE5 – Alegra v.01. By KellyLingus – This Product RIGGED ONLY WORKS WITH CATWA CATYA!!!! Pants : BLUEBERRY – Poppy Leggings –fatpack . By Blueberryx NEW!! !